One of the reasons I love ambient music so much is the real breadth of the expression and artistry on offer to the listener... from neo-classical melodies to electronic drones via guitar-orientated soundscapes... they all contribute their particular flavours to the genre. Ambient is richer as a result of this variety. 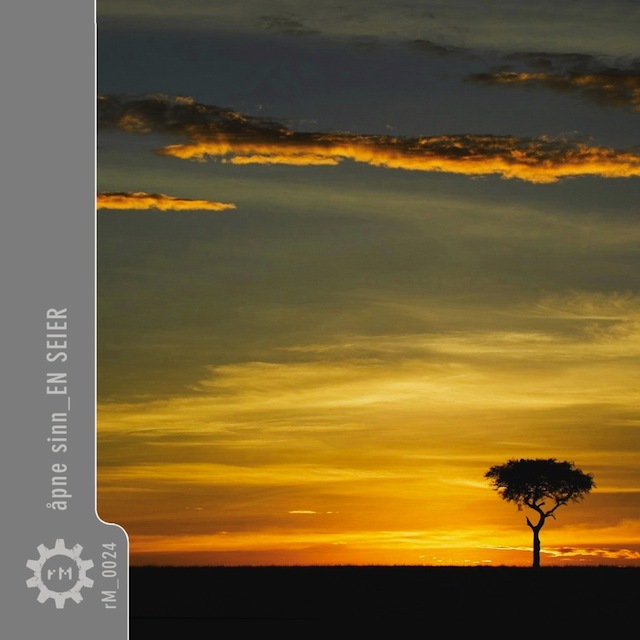 Relaxed Machinery's upcoming release... "en seier" by åpne sinn... is exemplary of this richness. On this release Geoff Small... the man behind åpne sinn... has created some of the most exquisite ambient soundscapes I have heard. He has created music worthy of a soundtrack. On the opening track "Son of low birth", for example, he brings to the table some wonderful ethic percussion and processed vocals that just make me melt and reminds me how wonderful the ambient genre is. Similarly his collaborations with Steve Brand are just heartbreakingly beautiful: haunting... emotive... and deeply immersive. "Unconquered", for example, has a gorgeous sense of movement and emotion that just draws me in. "The Long Plains" has a glacial elegance that you can actually hear sparkle and shimmer before gracious beats enter and complete the track. Small's collaboration with Peter James on "what rough beast" is fantastic and further demonstrates both the power and reach of the ambient genre and the creativity of both parties to the collaboration. This track is so deep with a field recording providing the foundation for some gloriously melancholic electronic drones. The title track... "en seier"... juxtaposes glitchy samples of bells and chimes with the deep rumblings of a powerful drone. Small does this to great effect... creating something sinister and yet playful... that threatens to overwhelm but never quite does... but in doing so, he creates something of extraordinary worth. My favourite track is the third one... "his great heart"... which brings to the table some wondrously mysterious and melancholic neo-classical string drones that instantly reminded me of the great emmalee^crane. There is an almost nautical feel about this track - it could easily soundtrack an HP Lovecraft story such as "The Shadow over Innsmouth". It is truly atmospheric and a real standout track for me. All in... with "en seier" by åpne sinn Small has created a truly exemplary recording... one that is worthy of real accolade and recognition. It will be on my iPhone/iPods for many months to come and will... I have no doubt... find itself remembered in the end-of-year lists of note. "en seier" by åpne sinn is due to drop in February.